Modules mostly for volume or pan modulation. inputs 1-8 will be consecutively sent to out, one after another, whenever a gate/trigger (switchable) message is received. input is consecutively sent to outs1-8, whenever a (switchable) gate/trigger message is received. without modulation signal connected, output volume is 100% of original signal. without modulation signal connected, output volume is 50% of original signal. Stereo version available (2Ch FeedbackMixCWM). Integrated Lfo to fade between inputs 1-4. Lfo Frq 0.01Hz - 400Hz. combination of quadPan and x/yPan&Control. Manu(al) or Mod (automated) modes. Visualization can be turned off (Mod mode only). 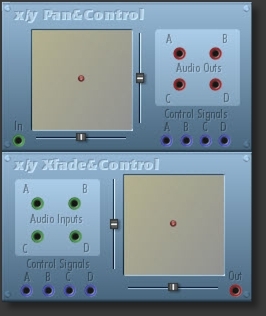 combination of quadXfade and x/yFade&Control.